A £50 non refundable deposit, along with a £100 bond is required at the time of booking. If it is less than 6 weeks from your booking date to your arrival date, the full rental amount and bond is payable immediately. No refunds are payable on bookings cancelled within 14 days of arrival date. Our 2 bedroomed caravan is situated in Maple Rise, a quiet location 5 mins walk from the main park facilities. There are front patio doors leading from the lounge on to a large deck which has been furnished with rattan effect chairs and table. Built-in caravan lighting provides illumination to the veranda which is supplemented by LED deck lights which are controlled by automatic timer. 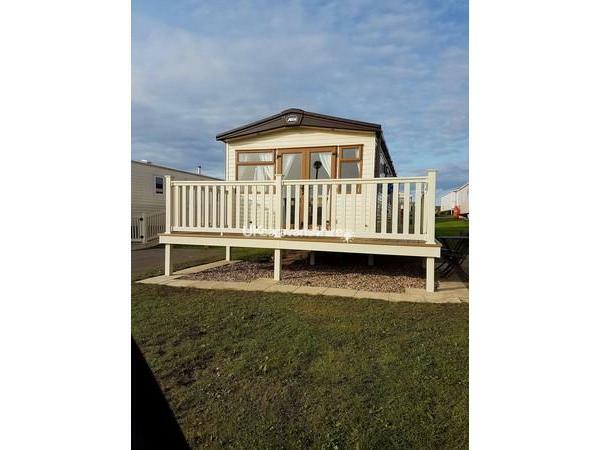 The caravan is rated as a "Prestige with Decking" on the Haven website. The caravan is centrally heated, with thermostatic valves to all radiators and is double glazed for comfort in all weathers. Additional heating is available via an electric feature fire fitted to the lounge. The lounge provides a large L-shaped seating area with a built-in sofa bed. Entertainment is provided via a 42" Smart TV with separate dvd player. There are USB charging points on most sockets throughout the van. The dining area consists of a free standing dining table with chairs, next to the open plan kitchen with built-in oven, grill, 4 burner hob and an externally vented cooker hood. The kitchen is further equipped with built-in microwave and fridge freezer. Crockery, pans and cutlery are all provided. Master bedroom furnished with king size, walk around bed, bedside tables, dressing table with seat and drawer space and hair dryer. Built-in wardrobes provide additional storage space with hangers provided. A 24" Smart TV with integral dvd player is included for your enjoyment. 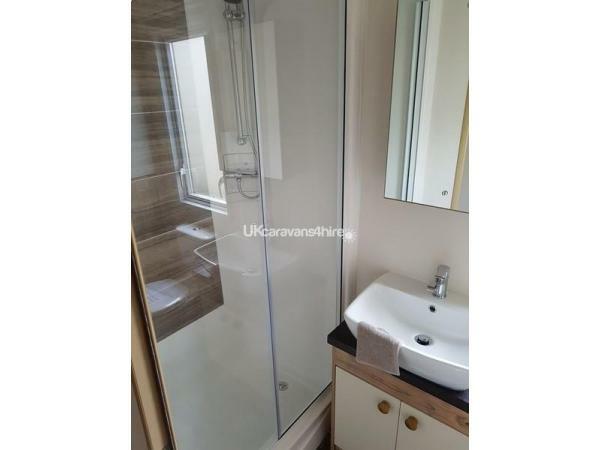 En-suite bathroom comprising of wash hand basin, wc and BATH complete with shower and fold in shower screen. Wall mounted bathroom cabinet and shelving for all your little essentials. To add to your comfort a centrally heated wall mounted towel rail is also fitted to the en-suite. The second bedroom contains twin single beds, bedside cabinet, hanging space and drawer storage. There is also a 24" smart tv on the wall. Main bathroom with wash hand basin, wc and large shower cubicle. 240/120v Shaver socket. For your safety there is a fire extinguisher, smoke alarms and carbon monoxide detectors fitted to the van. All quilts and pillows are included in your rental costs, you need only bring quilt covers, (king size for the main bed and singles for the twin beds) along with pillowcases, towels and dishcloths. I offer an optional bed linen pack at a cost of £25, all beds made up for you on arrival and the laundry is taken care of afterwards. A travel cot is available on request at no additional charge. High chairs are available from reception for a small additional charge. To access the main park complex entertainment passes are required, these are NOT INCLUDED in the price of your holiday, however they can be purchased from the Blue Dolphin Reception for a small additional cost. Amazing caravan with everything you need and more, having a hoover made my wife very happy. Having tea,coffee, milk and bottle of prosecco when you arrive is a nice touch. Its a 5min work to main entertainment. Would stay again and recommend to family and friends. Had a lovely weeks break in this beautiful caravan, situated in a lovely position. There were 4 of us , with an age range of 40 years ( no children)! We used the caravan as a base, and went out visiting loads of places nearby . We had a lovely welcome from the owners, Kathryn and Andrew, with some essentials to get us started. The caravan is very comfortable, with all the facilities you could need. 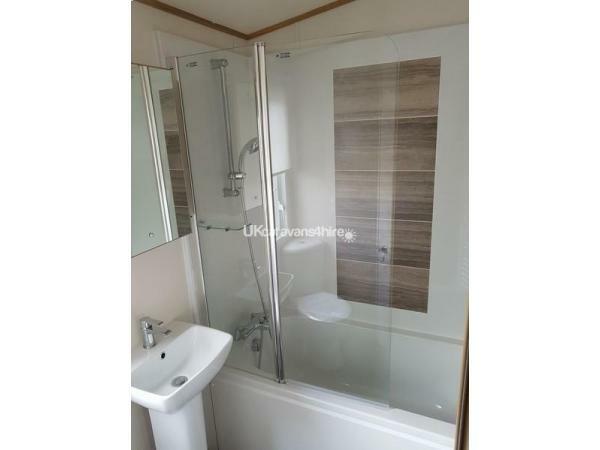 The shower in the main bathroom is lovely and powerful, and the en-suite off the double bedroom is fabulous. The kitchen is well equipped , and we had a few meals in the caravan, in the spacious dining area. The beds were very comfortable, and the whole caravan was exceptionally clean. All in all, we had a lovely, relaxing time, and would definitely love to go back. Many thanks for your lovely review, hope to see you back in the near future. 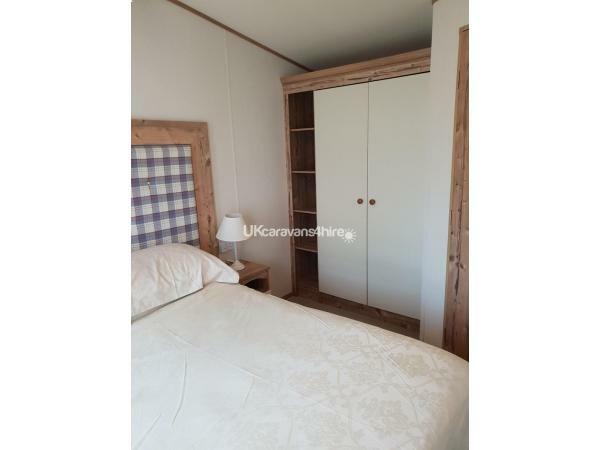 This is our first visit to the caravan and was very impressed with the look and cleanliness. The little extras were a pleasant surprise. Andrew and Kathryn made us feel welcome, greeting us on arrival. Loved it so much we have booked for next year. A beautiful, clean and spacious caravan with all necessary amenities (having a bath was an added bonus especially for our children) and a whole lot more. Andrew and Kathryn made us feel very welcome, greeting us on arrival and the little added extras such as coffee and milk for a brew and a little treat for the evening once the kids were asleep! This has been our 6th yearly visit to the park and Andrew and Kathryn have really gone the extra mile, we would definitely book with them again. A massive thank you as we have made some lovely memories. Pete, Nicola & kids. Many thanks for the review Peter, looking forward to seeing you all next year. A fantastic caravan, with fantastic facilities, in a lovely quiet area of the park . Just behind the caravan there is some great coastal walks and the views are spectacular ! A great base to visit Bridlington, Filey and Scarborough. Will definitely visit again in the near future ! A big thank you for a great holiday. My family and I had a fantastic holiday in this amazing caravan. It really is home from home being fully equipped with everything you could possibly need. The little extras upon arrival were such a nice surprise and very welcoming. Booking was easy and communications with Andrew were first class. Would definitely recommend. Excellent. Lovely, clean, immaculate caravan. It is on a nice quiet pitch, but within easy walking distance of all entertainment and facilities. Andrew could not have been more helpful and accommodating of us. Lots of little extras in the caravan to make us feel welcome and more comfortable. Travel cot set up for our arrival and night light for the kids. Great value for money, great hospitality, would highly recommend. Hi Pam thanks for the glowing review. Hopefully we will welcome you back in the future. Take care. Well presented caravan, spotless and excellent layout. Extremely comfortable. Owners very helpful and pleasant, they take great pride in the presentation of their caravan with extra touches that make all the difference. Thanks to them we had lovely holiday. Good bus service just a short walk from caravan. Another nice stay at Andrew and Kathryn's caravan.The weather was good too. We enjoyed it so much we have booked it in May.Many thanks to you both. Thanks for a great review, see you next month. We’ve had an amazing week (7-14th April) in this beautiful caravan, sited on a lovely pitch with a great designated parking space, in a quieter area of the park, although only 5 mins walk to the main facilities. From seamless booking communications to the warm welcome with thoughtful extras and spotless accomodation from Andrew & Kathleen, this review is truly deserving of 10/10. Everything we needed was there from quality kitchen utensils, crockery and cookware to handsoap and lots of storage. We even had one nice(-ish) evening where the sun shone over the South-West facing verandah for a while... so we quickly got out the cushions for the outdoor furniture to enjoy it! 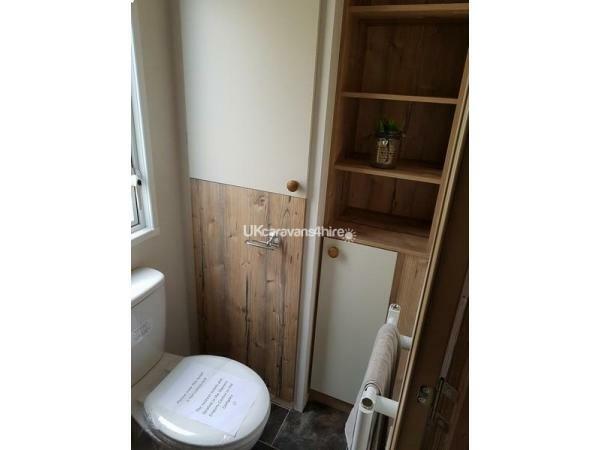 The kids adored their room with their own TV, and the ‘awesome’ cutlery, plus the ensuite bathroom is fantastic for families with younger children, although the shower room was fab, as well. The beds/bedding are really comfy too, so we all feel refreshed. Thank you again, it was a home-from-home and I wouldn’t hesitate to recommend your caravan to anyone! We enjoyed a very comfortable stay in this immaculate caravan. Andrew made booking and checking in easy and pleasant nothing was too much trouble. The location was great with lots of things to do and good places to eat. We hope to return in the summer. Highly recommended. Lovely caravan spotless. Andrew was very friendly and helpful. The extra touches were lovely. Easy to book and good value. In a good area with lovely views. What an amazing week we had staying in this beautiful caravan with its fabulous decor and it contains everything you need when you stay away from home. On arrival we were welcomed with a few little extras so we could have a cup of tea/coffee on arrival which we thought was a lovely touch. 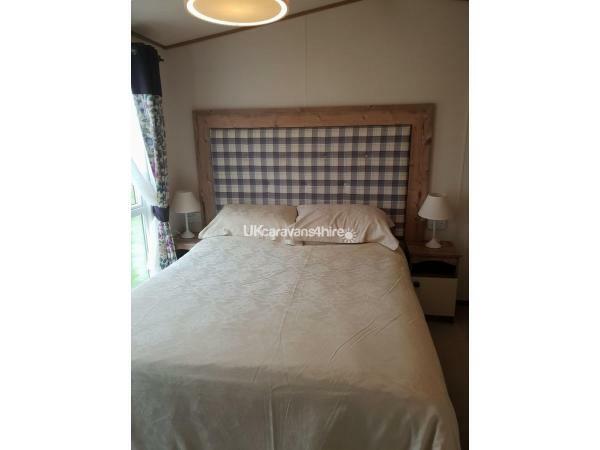 The caravan is in a perfect location on the site and very easy to find. The weather was great and the site is perfectly located for all the surrounding places to visit. When we didn't use the brilliant kitchen/dining area we visited a couple of places Andrew the owner advised us of. We will definitely be returning. Had a lovely break in your beautiful holiday home, was a nice touch to meet Andrew to show us around. Would highly recommend, hope to stay again soon, thanks Dianne and Ken. 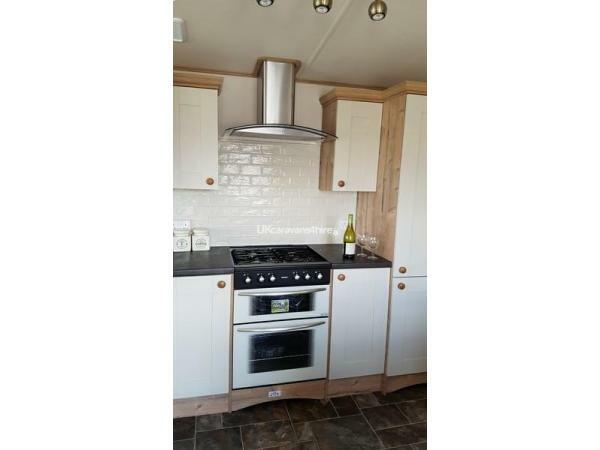 Caravan is brand new and very clean, on a good pitch with lovely views. Booking and payment is easy and owners very helpful. Lovely break away. It was an absolute pleasure Paul, you are welcome back anytime. The caravan was left spotless many thanks to Julie. Fantastic Van, brand new, when we stayed it was 13 days old!. Great owners who made us feel very welcome. The van itself is right up there with the best we have stayed in over the years. Will hopefully be up again in 2018. first time in Yorkshire and feel very lucky to have found Andrew's Caravan 10/10 Good luck with the venture.